This 59 year-old male diagnosed with Adenocarcinoma of the pancreatic head was found to have a 21mm Ground Glass nodule in the RUL. 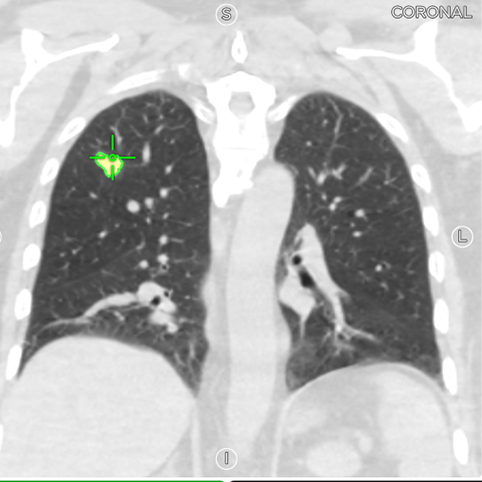 The main question was whether this nodule represented a primary lung cancer or a solitary pulmonary metastasis. A tissue diagnosis was essential as the treatment and prognostic implications of the two scenarios are dramatically different. For instance, if the lung nodule is a primary lung cancer both primary cancers will be treated surgically with a potential of cure. Whereas if we are dealing with metastatic pancreatic cancer, the treatment will be chemotherapy with a much less favorable prognosis. 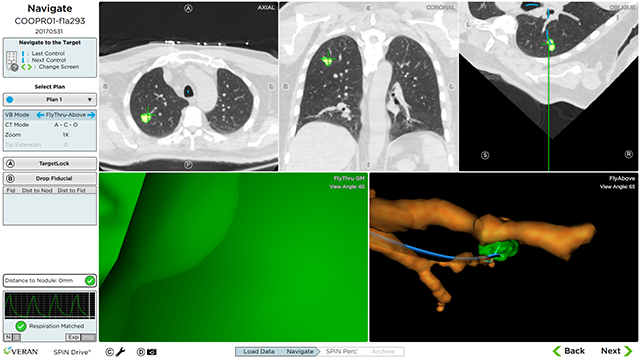 Dr. Boujaoude and fellow, Dr. Ghali, created a plan to target the 21mm RUL nodule using Veran’s SPiN Planning™ software. 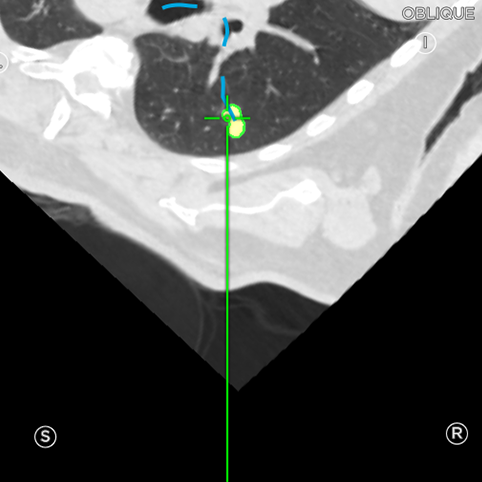 The software automatically segmented the nodule and determined the optimal path to the target. 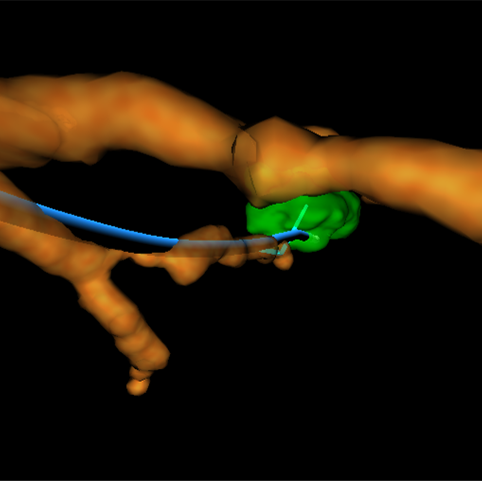 The procedure started with navigation and with the Always-On Tip Tracked® forceps used to verify accuracy with a main and secondary carina check. Dr. Boujaoude successfully navigated to the 21mm RUL nodule to obtain multiple samples using the Always-On Tip Tracked® brush, serrated cup forceps, and 19ga histology needle. The samples were analyzed by ROSE and were found to be positive for Adenocarcinoma. Further comparison with the cells obtained from the pancreatic cancer confirmed the pancreatic origin of the Adenocarcinoma. The patient was started on systemic chemotherapy.